I last saw SolarWinds during Tech Field Day 10 around three years ago. That was just before they went private, and I was keen to see what the plan was for SolarWinds as a private company. SolarWinds has just gone public again, via IPO late last year. I took a quick look at the financials again, just to see what had changed, though we don’t yet have full year financials and there’s a gap in the history as a consequence, so be skeptical of the numbers and charts here because a lot of it is interpolated from available data and could be very wrong. There’s enough here to give us a broad understanding of what has happened during the private days, so let’s take a look at that. SolarWinds is much larger now. The nine months to 31 September 2018 saw revenues of $611 million, compared to full year revenues in 2014 of $428 million. My forecast for 2018 is for around $815 million so SolarWinds is bringing about twice as much revenue as it was three years ago. This is on a much bigger asset base, though. In 2015, SolarWinds had about $827 million in assets, about half of which was Goodwill (which is the ‘extra’ paid for an acquisition of another company above its book value). Now, SolarWinds has about $5,168 million in assets, so about 5 times as much, and Goodwill makes up about 72% of total assets. If we look at total intangibles (so, Goodwill plus other intangible assets) as a percentage of total assets, this has gone from 56% of total assets at the end of 2014 to a whopping 91%! How did SolarWinds get all these intangible assets? Acquisitions, a lot of which was financed by debt. Some of the intangibles appeared as part of the Take Private transaction as well. In 2014, SolarWinds had very little long-term debt, about $23 million or 10% of total liabilities. Now, SolarWinds has $2,216 million in long-term debt, which is 77% of total liabilities. Those people are going to want their money back. 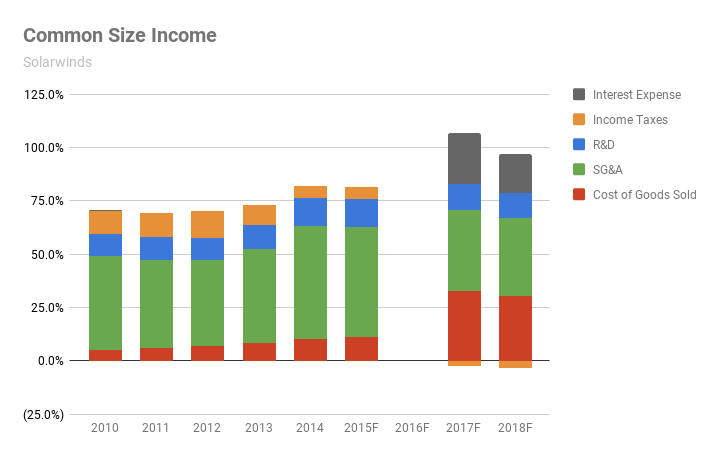 Interest expense is chewing up about 18% of revenues, though that’s down from about 24% from last year, and this is a major reason for SolarWinds lack of profitability right now. The data available in SEC filings is a little complex and thin right now because of the timing of the IPO and the end of fiscal quarter for SolarWinds, so when we get the full year results sometime soon, the numbers will be a little clearer. I expect that some of the IPO cash will be used to pay down debt, which will free up operating cash for investing in the business instead of paying interest. The challenge for SolarWinds is how to ensure that it can make good money on all its acquisitions to justify the money it paid for them. The new SolarWinds isn’t making nearly as much money off its assets as the pre-private SolarWinds (asset turnover is around 0.15 when it used to be around 0.5). All the returns are from massive leverage funded with debt. The returns to shareholders are, so far, from capital growth in the stock, which has gone from a list price of $15 to $17.55 at market close on 31 Jan 2018, which is closer to the price SolarWinds was originally intending to list at. Why did I look at all this boring finance spreadsheet stuff instead of the technologies? Partly because I actually enjoy it, but also because it provides good context for what the company strategy is. SolarWinds was talking about “becoming the IT management vendor of choice for managing all things IT regardless of where the IT asset or user sits, organization size or infrastructure complexity,” according to Kevin Thompson, President and CEO of SolarWinds. Okay, so how do these acquisitions funded by debt help you do that? How does becoming a public company again after just under three years of being a private company help you do that? How do all these tools and technologies fit together to help customers manage their IT? What makes them so great that customers will hand over enough cash to make adding these companies and their tools to the SolarWinds flock worth it? That’s what I’ll be looking to understand as SolarWinds presents to us. Disclosure: SolarWinds is a past PivotNine client.